I’ve been working on one of the fronts of the $1.50 cardi, the cabled side. But for some reason, every time I look at it, I think it is a sleeve, and then I think ‘that’s too small for a sleeve!’, and wondering why the directions tell me to knit for something like 15″ without any shaping for my little arms. Then I remember that I am in fact knitting the front of a cardigan. Then the next time I pick it up, I go through it all again. It’s a vicious cycle. The other mistake I made was in the lace pattern. There are no stripes on this side, just a cable and lace around it. For the stripey part of the sweater, you do the lace rows in a certain sequence. I did that for the lacey part of this front, and found I was getting an odd stockingette stripe in my lace, for just one row (well, rows 7 & 1). It was small, but noticeable. I re-read the front directions, and it seemed like I was doing it right. Then I re-read the lace directions, and found that it said ‘repeat rows 3-6 for pattern’. I see now that you just do the other rows when you’re about to finish the lace pattern, so it isn’t lopsided or anything. At some point in my knitting life, I would’ve just left it, because it wasn’t a glaring thing. But I want to have more confidence in my knitting, and be more likely to wear things out, so I ripped back. It felt good! I’m not scared of ripping out any more either, I now have enough faith in my self to rip back to the right place, and pick up all the stitches. I’ve been good about not buying yarn. It’s hard now that I know Pudding Yarn is so close to me. I practically walk by it every time I go to rehearsal. It’s hard not to stop in, but I haven’t. The last thing I bought there was Rowan 40. I love the foresty rustic style of the the cover photo, and the ‘story’ that piece belongs to. I want to be more woodland in my style of dress. (I also find I like a kind of Victorian street urchin style for winter. Men’s style trousers, vests, fingerless mitts, leather shoes, all very pretty. Not that I have much like that, but I like to imagine. I want a good pair of brown leather boots for next winter. See also HotPatterns’ Artful Dodger line). Has anyone heard about Yarn School? I would love to go, but I either have to fork out $400 airfare, or drive for 25+ hours. ick to both! If it was within a day’s driving distance, I would so go, it looks like it’d be wonderful. I wouldn’t pay the fee plus the airfare, even though it would be fun. If I’m spending that much on a vacation, I want to spend it with my loving boyfriend. I donated to a book fund on her blog a few months back, and I got this in the mail in return a little while ago. Green and purple, two of my fav colours! yay! I’m thinking of Horcrux socks. Vinnlands first though, and I’m not casting on for those until I have at least this front of the $1.50 done. 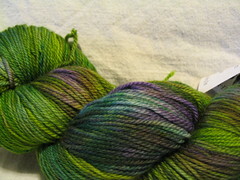 This entry was posted in Future Knits, Knitting, Sweaters and tagged dollar and a half by rycrafty. Bookmark the permalink. you have my roommate’s exact birthday! p.s. that rambling rose sweater is beaaauuutiful!